Alaska Native News Dec 21, 2016. In one of his final moves in the waning days of his presidency, President Obama designated huge swathes of seas off of the coast of the Atlantic seaboard and the Arctic Ocean off limits to off-shore oil and gas lease sales. While in-coming president, Donald Trump has vowed while on the campaign trail to open up the nation’s energy reserves, President Obama utilized a 1953 law to ban leases permanently in the outer continental shelf waters. It is widely believed that the move to ban those waters from oil and gas development will withstand efforts from future commanders-in-chief to reverse, as the 1953 statute provides no authority for presidents to undo permanent withdrawals. While many on the east coast of the U.S. were hoping for more off-shore areas to be closed to oil and gas leases, Obama shut down 31 undersea canyons from the oil industries. Leases currently in existence will not be affected by President Obama’s Tuesday decision. In a statement released by the White House, the ban was initiated “due to the important, irreplaceable values of its Arctic waters for Indigenous, Alaska Native and local communities’ subsistence and cultures, wildlife and wildlife habitat, and scientific research; the vulnerability of these ecosystems to an oil spill; and the unique logistical, operational, safety, and scientific challenges and risks of oil extraction and spill response in Arctic waters – the United States is designating the vast majority of U.S. waters in the Chukchi and Beaufort Seas as indefinitely off limits to offshore oil and gas leasing.”Canada followed suit and designated all Arctic Canadian waters off-limits to oil and gas exploration as well. 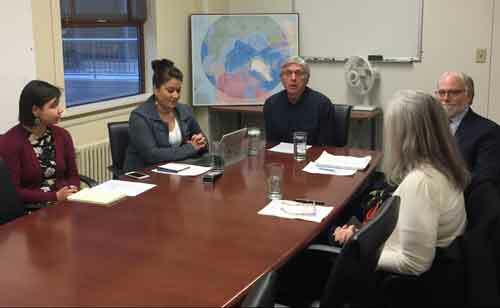 The announcement came after the creation of the “Northern Bering Sea Climate Resilience Area” in what he said was a direct response from over 80 tribes asking for protection of cultural and subsistence resources. “This unprecedented move marginalizes the voices of those who call the Arctic home and have asked for responsible resource development to lower the cost of energy to heat houses and businesses. For centuries, the Arctic has provided food for those in the region. No one is more invested than Alaskans to ensure that the habitats within the Arctic are protected. To lock it up against any further exploration or development activity is akin to saying that the voices of activists who live in Lower 48 cities have a greater stake than those to whom the Arctic is our front yard and our back yard. Alaska’s delegation to Washington slammed Obama for his decision on Tuesday, saying the withdrawal disrespects Alaskans and is not based on sound science. All three delegates, Senators Lisa Murkowski and Dan Sullivan, and Representative Don Young made statements in response to the ban. 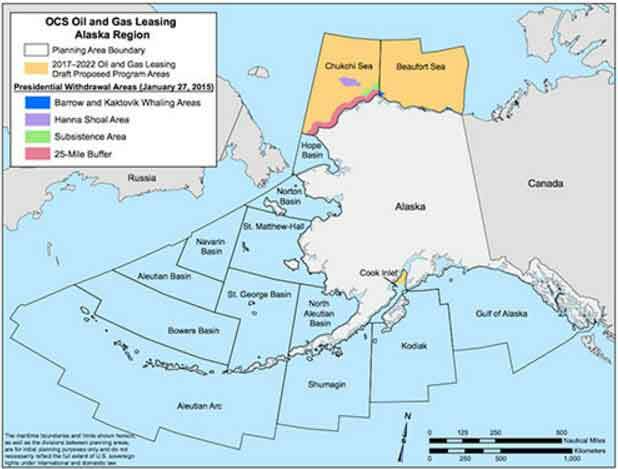 It is believed that the Beaufort and Chukchi Seas hold approximately 23.6 billion barrels of oil and 104.4 trillion cubic feet of natural gas.